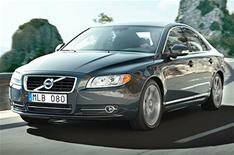 First pictures: face-lifted Volvo S80 | What Car? This is the face-lifted Volvo S80 saloon, which goes on sale this summer. The car will be on display at next week's Geneva motor show.